According to the Bureau of Justice Statistics, over 17 million Americans were victims of identity theft in 2014, and that number continues to grow each year. 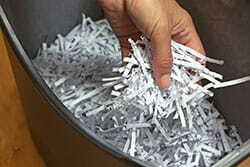 Anything with your name and address, bank account details, credit card information (current or expired), Social Security number, pay stub information, usernames or passwords, or even your signature makes you vulnerable to identity theft, which is why document shredders are so invaluable to keep your information safe. With a focus on security features, including shred size and types of materials that can be shredded, we’ve got our top five picks for the best document shredders for keeping your information safe. Shred Size 4 x 38 mm. 2 x 12 mm. 4 x 12 mm. 4 x 32 mm. 4 x 10 mm. 4 x 38 mm. 2 x 12 mm. 4 x 12 mm. 4 x 32 mm. 4 x 10 mm. While any kind of shredding is preferable to just throwing away sensitive documents, some shredders have features that turn the security up a notch and even make the shredders themselves safer to use. While using a strip-cut shredder is better than nothing, we recommend using a cross-cut or micro-cut shredder to make it extremely difficult for anything to be pieced back together. The smaller the shred size, the better. The German Institute for Standardization (Deutsches Institut für Normung or DIN) Security Standards define the international standards for paper shredding. 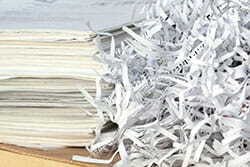 Currently, shredders are classified by DIN 66399 into seven levels of security (P-1 through P-7). Security level P-3 and up are for sensitive or confidential documents. P-3 is for confidential information, such as internal company documents, and P-4 is for sensitive information that requires high protection. Anything above P-5 is generally used for commercial or governmental use. The most secure shredders can handle more materials than just paper. 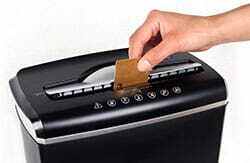 Most can process plastic credit or store cards, and some can even destroy CDs and DVDs. These shredders can also usually shred staples and/or paper clips left on your papers, which doesn’t necessarily add to the overall security of the machine, but certainly makes it easier to use. Most shredders also have a light that alerts you if your shredder is overheating, and some even have an automatic shutoff feature if that happens. Be sure to pay attention to usage and processing volume recommendations. If you overload a shredder meant to handle only small volumes at a time, it will wear out quickly, but there’s no need to pay for a shredder meant to process hundreds of pages if you don’t anticipate needing that. Also check the speed of the shredder measured in feet per minute (fpm), as that will factor into how many papers you can dispose of in one sitting. You probably don’t need a particularly fast machine for personal use, but if it’s too slow, you may leave out documents waiting to be shredded, which could be potentially unsafe. Also known as a shred cycle, this is the length of time a paper shredder can run continuously before the cutter blades will begin to overheat. The cycle includes a run time and a cool down; run times can be as short as two minutes and cool down times can be as long as 90 minutes depending on the machine. As with the speed of the shredder, the advantage to having a machine that can run longer is that you are less likely to have a pile of unprotected documents out in the open while you wait for you shredder to cool down. To determine the overall effectiveness, you really have to look at both the duty cycle and the shredding capacity. For example, even if you have a shredder with only a 3-minute run time at 6 fpm that can take 8 sheets of paper at a time, you’d still be able to shred 156 sheets of paper before it needs to cool off. While budget, size, and ease of use are important factors in choosing a document shredder, our rankings were determined by the level of security and additional safety features we found. The security ranking, shred size, safety features, and range of materials were the most heavily weighted factors. As a result, all five of these products are highly secure as well as usable. The Fellowes Powershred 79Ci is a heavy-usage shredder that can handle almost anything. It’s a cross-cut shredder with a shred size of 4 x 38 mm. While this size is longer than any of our other top picks, it is still too small for an identity thief to piece together any of your information. It’s also enough to earn the Powershred 79Ci a P-4 security level (recommended for highly sensitive information, like something with your bank account or social security number). The Powershred 79Ci is equipped with the Fellowes SafeSense Technology, which will automatically turn off the shredder if it senses fingers too near the opening. This is especially important if you need a home office machine and you have small children at home. The Powershred 79Ci can process up to 16 sheets of paper at a time and shreds through paper clips, staples, credit cards, and CDs/DVDs. To top it off, it has the best warranty we’ve seen—two years on the machine and a lifetime warranty on the cutter. The combination of the security level, range of materials it can shred, SafeSense feature, and excellent warranty make this cross-cut shredder our #1 pick for either home or office use. Our #2 pick is another heavy usage Fellowes product: the Powershred 99Ms paper shredder, a micro-cut shredder with a shred size of just 2 x 12 mm, earning it a security level P-5 (recommended for highly confidential or secret information). 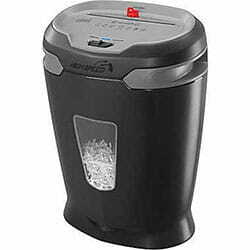 It also has the Fellowes SafeSense Technology that shuts off the shredder if fingers get too close to the opening. The Powershred 99Ms can handle up to 14 sheets of paper at a time and also cuts through staples and credit cards, though it does not shred paper clips or CDs. It has one of the faster feet-per-minute rates we saw at 11 fpm and can run continuously for 20 minutes before overheating. Although it might be more than you need for home use and it’s unable to shred CDs, the Powershred 99Ms has one of the highest security levels of any personal/small office paper shredder we found and that placed it near the top of our recommendation list in the #2 spot. With a shred size of just 4 x 12 mm, the Amazon Basics 12-Sheet High-Security Micro-Cut Paper, CD and Credit Card Shredder has a security level of P-4, plus it can cut up staples, paper clips, credit cards, CDs/DVDs, and even cardboard in addition to paper. This shredder has an 8-minute shred cycle at a speed of 6 fpm, though if it begins to overheat, an overheating alert will light up and the machine will automatically shut off. As an added safety feature, it also has an angled paper feed entry point, which prevents fingers from accidentally getting too close to the cutters, though it isn’t quite as secure as the SafeSense feature of our Fellowes picks. However, these extra bits of security bumped the AmazonBasics 12-Sheet High-Security paper shredder up our list to be #3, making it a great pick for both a home or small office with medium usage needs. In our #4 spot is the Staples 12-Sheet High-Speed Cross-Cut Shredder, with a shred size of 4 x 32 mm. It can take all the usual materials (paper, staples, credit cards, CDs/DVDs) except paper clips, but it runs at an amazing 14 fpm, the fastest we’ve seen in a personal paper shredder. It takes up to 12 sheets of paper at a time with a 6-minute continuous use/90-minute cool down shred cycle before you’ll get an overheating alert. It only has a security level of P-3 (good for internal company documents or your personal info, but not the most sensitive information, like banking details or social security numbers), which brought its rating down a bit on our list. However, it is equipped with a safety lockout feature that allows you to lock the machine when it’s not in use so small children or pets can’t accidentally turn it on. One of the drawbacks of this product is that it weighs 26 pounds and the top has to be lifted off in order to empty the waste basket. If this isn’t a dealbreaker for you, though, this would be a great high-speed cross-cut shredder to consider. Dimensions: 21 x 16 x 10 in. The last paper shredder to make it on our recommendations list is the Bonsaii DocShred C156-C paper shredder. It’s a micro-cut shredder with a tiny shred size of 4 x 10 mm and a security level P-4. It takes up to only 8 sheets of paper at a time at 6 fpm, but it can also shred CDs/DVDs and credit cards, as well as any staples or paper clips that end up in a stack of papers. The Bonsaii DocShred C156-C is not a heavy usage machine, as it can run continuously for just 3 minutes before it needs a cooldown, but that it pretty typical of personal paper shredders. It also does not have any extra safety features other than an overheating alert. However, it is still a solid product choice with a great security level for such a compact size (with the added bonus of being the most inexpensive of our picks), and that earned it a spot on our list of recommendations. Dimensions: 17.7 x 13.8 x 8.6 in. Whether you need a document shredder for personal use or at your office, choose a machine that will give you the widest range of security options. Look for products that can shred more than just paper and use cross- or micro-cut shredding for higher security ratings. Safety features that will protect you and your children from accidents are especially important for home office use. Pay attention to the other specs, such as the fpm speed, the shredding capacity, and the duty cycle times so you can shred everything you need to in one batch. It may seem strange to think that your personal details need to be protected even in the trash, but using a document shredder to dispose of anything with your information on it is the safest and smartest way to go.